You are not a very kind or intelligent person and you should rethink how you use your time. Didn’t need a spoon, but I did the research. Not a single respected medical study proves this, only that vaccines flare up lupus in people that already have it. People are here trying to understand what loved ones are going through and you decide to be a jerk. How about you use one of the few brain cells you have to find a better use for your time. Geez, Janis. You can thank vaccines for your lupus. Was it worth it to avoid possible exposure to measles, mumps, rubella, chicken pox, etc.? Vaccines trade acute illnesses for chronic ones. You don’t have to take my word for it; you can use one of your spoons to do your own research. Thank you for an insightful way of explaining something that until now was almost impossible. Our daughter has Addisons Disease, that wasn’t diagnosed until later in life. And your exclamation works so well. I have RA and I thank you for sharing this, finally a great way to explain how some days go. It depends upon the individual and what the underlying condition is. The “spoons”, after all, are a metaphor for one’s energy level. I don’t actually use a number, just gauge how I am feeling and try not to over schedule myself. But, at 69, I have had years of experience to learn my limitations. Yes. That is, in fact, how many of us got here. Do people tend to give themselves 12 spoons a day as a baseline? I had a friend who used this system and am planning on starting it myself. I love your explanation on basically a chronic illness. I suffer from Fibromyalgia and most days I cannot even get out of bed. Would this be something I could share on my Facebook feed? Thank you for sharing your experiences with this awful disease, Shawna. My Asthma is bad right now. It feels like it’s getting worse, making the Sarcoid more difficult to cope with. My joints are getting more painful. Tiredness and fatigue is causing me to sleep for longer. We both have to consider ourselves “fortunate” we don’t suffer from skin Sarcoidosis. Those poor souls endure painful skin lesions. I have fought sarcoidosis since 1997. I am blind in one eye now (always once a month test the Amsler Grid!!!! If any of the lines are curved or are missing get to a sarcoidosis ophthalmologist!!!) it started in my lungs, they ended up having to biopsy a huge lymph node because it was sitting against my aorticarch. Whew that felt better. It didn’t end for me though I started forgetting things, it came to my brain. I have two boys and a great husband and it’s horrible to have them help me to the bathroom and such. The lung hospital in Denver Jewish hospital has recently found what they think is a cure for autoimmune conditions. They even mentioned a special test group of sarcoidosis… so there is hope. Hope you will feel good soonsoon. Thank you for sharing this. You’ve given me a way to explain my mental illnesses to the people I love. For years, I’ve struggled with mild anxiety, moderate to severe depression, and post-traumatic stress disorder. Some days it’s a miracle for me to even force myself to wake up, and people have often undermined my illnesses as “an excuse to be lazy.” I never knew there was a way to explain it until I got curious about a friend of mine calling herself a “spoonie.” Now I can tell everyone the truth in a way they can hopefully understand. Thank you, Christine. Since I know that I have autism and fibromyalgia I count my spoons. Before that I just went on until I had a Burn-out and depression. Thanks for the explanation, I can us is for my friends and family. *through tears*… TAKE ALL MY SPOONS!! This made me cry to read this because this is my life every day this really put it eloquently maybe I can explain it to family friends colleagues and strangers Who always have unhelpful theories and tips and hints because they don’t understand people who are healthy have it so easy they can frivolously and flippantly go about their day and I am jealous. I used to be one of them. No I have to weigh each decision carefully and I really like the part about borrowing spoons against the next day because if I have a good day and get a lot done the next day I am a wreck and in bed like today. I always feel like I have to choose so carefully and I can never do two big things in one day. It makes me angry but I have to learn to except my boundaries and limits. And even the part about taking a shower getting dressed then even choosing what kind of clothing to wear depending upon my arthritis that day made so much sense for me too thank you so much for this article. Hopefully you have someone to help, someone to save you a spoon or two. I was one of the most energetic people walking the face of the earth, then came this horrible muscle aches and all over other neuropathic pain with extreme fatigue. this happened because of workplace injuries & exposure to toxic chemicals. Been living in hell everyday ever since going on 32 years. I believe people need to develop more empathy and compassion over all in our society as it is poorly lacking. Most family and friends, especially should be more so. I’m still trying to explain but, they’re in denial because they want to remember their mom, friend, wife like they were once. It’s a hard concept to give up, to see one of your own on the down low, all of the time. I just pray that none of them ever have to go through the same thing, BUT I’LL BE THERE FOR THEM NO MATTER HOW BADLY I FEEL just like I’ve been trying for so long. Empathy and Compassion. Two words that need to re-enter back into our every day vocabulary! I love spooning in bed.we both I love it. It relaxs my pain especially my back and hip area. Using the spoon analogy, having to take Prednisolone uses up two spoons before anything else happens. Other medication’s side effects cause similar deficits. No, Amba you do not understand the physical effects of chronic illness. It is not “the human condition” and yes, it is disabling. Some people do remember what they were like before chronic illness changed their lives forever. Some autoimmune diseases are difficult to diagnose and stay a mystery as to why a person feels constantly tired and run down. The Sarcoid I suffer from, was first diagnosed by chance because of X-rays for my chronic Asthma. One thing I have noticed about chronic illness, particularly auto-immune disease. They all seem to have the same underlying symptoms. Describing what you go through every day, is what I endure, EVERY DAY. I have chronic Sarcoidosis/Uveitis and Asthma, both the Asthma and the Sarcoid are in my lungs. The Uveitis is in my eyes as a result of the Sarcoid. My breathing is severely restricted as my chest is always tight, despite taking medication for the Asthma. The Sarcoidosis is also responsible for the tightness. I have little defence against chest infections since my immune system is attacking my lungs, that is the Sarcoid. I don’t have chronic fatigue syndrome, because, as my doctor said, we know exactly why you are constantly fatigued. I have a “set” amount of energy in a 24 hour period. If I use it up and start to borrow from the next 24 hours, I “crash”. That is, I sleep for another 24 hours, waking only to go to the toilet, drink, freshen up and brush my teeth and back to bed. It is unavoidable and irresistible to sleep, you cannot stay awake. I also take Prednisolone for the Sarcoid when it flares and for the Asthma, particularly when I get a chest infection. I pay a high price for Prednisolone, it is a big shock to my body when I start on 50mg and taper off to 12.5mg then stop after 8 days. Aside from the side effects that come on after 24 hours of starting the course of Prednisolone, including nausea and dizziness and water retention, I then suffer the withdrawal symptoms for weeks after. This includes more fatigue and by definition, less usable energy. I suffer memory loss, cognitive impairment and irritability, nausea and dizziness. I’ve been warned, the more I take Prednisolone, the worse the side effects and withdrawal gets with every course into the future. Unfortunately, I have attempted numerous times to explain what chronic illness and Prednisolone does to me, to no avail. My family and friends just DO NOT GET IT!! After the latest explanation, they are OK for a few days, but they soon go back to the same rut. Annoyed that I sleep a lot, annoyed that I can only do limited physical work, annoyed that I don’t feel like going out. And why is that ….. BECAUSE I DON’T LOOK SICK. Ever since I discoverd the Spoon Theory, I’ve been using it to teach outhers about fibromyalgia, chronic fatigue, and M.E. It’s is absolutely PERFECT in every way, and people are always amazed when they “get it”. I can’t thank you enough Christine! Most definitely a valid point, and I’m glad you covered my blind spot in that. Not forgetting that Spoonies deal with the impossibility of regaining spoons. If you can regain your spoons, count your blessings, but don’t dis those who cannot. That is somewhat reductive TBH. Of course the concept of spoons applies to everyone to some extent, just like many concepts. Like those other concepts though, it’s something that people with physical and/or mental disabilities experience to a much greater extent, and something they may be more aware of than people with fewer issues themselves. Sometimes, no matter how much you push, you cannot gain more spoons. That’s just the way it is. Pushing through zero spoons does not incease the spoons like say, adding more weight can increase how much you can lift if you are a weightlifter. Recognizing that is not easy. Recovery can also mean different things to people. The main thing is we will not be cured of these diseases. We have to live with them for the rest of our lives and some of us will continue to add new symptoms as we age. I promise I am not trying to be negative or shun physical therapy – I love mine – but just know some of us can’t “buy more spoons”. Wow! I have Diabetic Neuropathy, which makes it hard to sleep, so I am always short on spoons. Brandon, have you been tested for EDS? You describe many of the symptoms. I have the high pain tolerance too. Your story sounds so much like mine. I understand IC very well having had it most of my life. I am 66 now and wish that people would see me as a person worth knowing instead of looking at me like I am dirt. Thank you for this. I suffer from RA and Chronic Migraines. It isn’t easy. Some days I dont even get 1 spoon. I’m stuck in bed in a very dark silent room all day. Sometimes multiple days. I have been very fortunate in having such an understanding family and an amazing Husband who at least try and understand and who give me the patience I need. Thank you so much for posting this. I shared your theory on my blog about my journey dealing with my illness. It is a beautiful way to explain my current daily limits. Thank you! This story has given a tangible/visual explanation about my daily struggles with Sjogrens and RA. It gives me something to share with those around me who just don’t get it. Thanks! Thank you. One of the defining characteristics of Chronic Fatigue Syndrome is that exercise actually makes you more tired, instead of energized. A well-meaning friend of mine dragged me to a yoga class after spending the night at her house. I needed to shower first, so she woke me 3 hours earlier than I am used to waking, which was devastating. Then having to shower quickly sapped the last of my energy, as I usually take 30 minutes because I have to rest periodically. Then the yoga studio was FREEZING, and a fatigued body cannot heat itself so I was miserable. The first thing the instructor asked us to do was JOG around the room barefoot! I had just recovered from a year with plantar fasciitis, a painful disorder of the feet that is agonizing, so there is no way I was going to risk it. I went outside to sit in the sun and warm up. My friend and her mother were irritated that I was such a “bad sport”. That hurt more than anything else- being judged after they had just worn me out and put me through hell. I was sick for days afterward. You might get a faster response if you just scroll up and order a small poster. I have rheumatoid arthritis, and I’ve never read anything like this. Just came back from holidays with friends and family. I was invisible for them the days I had my two injections and the day after, when I usually have two small spoons to take care of myself. It hurt a lot, but from now on I will speak up and be a spoonie. Thank you! 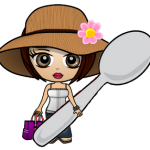 I am an Autistic woman who identifies strongly with your Spoon Theory, although I usually refer to my ‘copes’ rather than my ‘spoons’. I would love to have your permission to print a copy of this for my Autistic daughters’ kindergarten teacher to help her understand all the energy that goes into just turning up each day, and the need for down time to recover ready for the next onslaught. Thank you in advance! did you give a copy of the Spoon Theory to your therapist? Sounds like they need a dose of reality for those you have hidden illness/pain. People who don’t suffer such limitations have no grasp on why or how you are limited. So they think pushing you will get you moving and that will help. Not really. If I overdo it I pay for it at least 3 days with a headache and fatigue. It’s really frustrating and hard to accept in yourself that you have to be aware of your limits. I’m still trying to find a way to tell myself to STOP even tho that inner voice has told me to, I often ignore it- or it chimed in too late. I found setting an hourly chime for the day helps remind me either to move around because I’ve been sitting too much, or to stop and rest and take inventory of my physical exertion- it’s called BlipBlip and is free. You might check it out. I too have IC – but control it mostly thru diet. I have other issues that cause chronic pain as well- so I keep eliminating things from my diet- I’m beginning to wonder if I’ll reach a point of not having anything I can eat. Some days are complete down days because of the entire package… a friend showed me the spoon theory years ago and I’ve referred many others to it. Families and friends without health limitations have a hard time grasping why you can’t _____ right now. This is such a helpful tool. I admire your use of the descriptor, “temporarily able-bodied”! But for the Grace of God, anyone’s life can take a sudden turn, changing healthy high-functioning people into “Spoonies” like those of us living with chronic conditions, which can frustraringly hijack our best intentions to live functional, fulfilling, contributing lives, as most people want.